Hi Friends! I hope you all had a wonderful weekend! My weekend was jam packed with a lot of relaxing. It was awesome, and definitely needed. When I wasn't relaxing, I was shopping, which could potentially be defined as relaxing since it was therapy, retail therapy that is! Anyway, I'm always looking for ways to make my busy life a little easier. With that being said, I've been wanting a second garbage can specifically for recyclables, for a while now. Our neighborhood started offering FREE recycling about a year ago and since then, I've made an honest effort to recycle as much as possible. The husband isn't as dedicated to recycling as I am so I figured if I could make recycling easier than it already is, it would be a win in our household. We already have a stainless steel garbage can that we received as a wedding gift, and I wanted something that would match but all the choices were quite expensive. After much thought, I decided it would be worth the investment. Plus, I was able to score a 20% off coupon at Bed, Bath and Beyond. With coupon in hand, I set out to find a solution to this recycle apathy I have going on in my house. 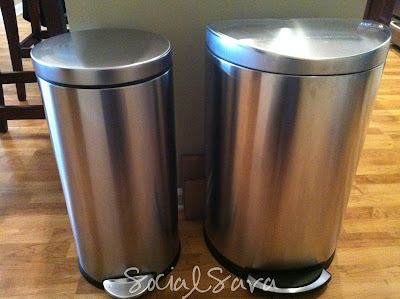 I opted for a smaller round stainless steel trash can that happens to fit perfectly, right next to our main trash can. Success! I can't believe how happy this new addition to our kitchen has made me! What little things make you happy? Who knew it would only take a trash can to make this girl happy! I consider shopping a form of relaxing too! I LOVE retail therapy. Even browsing seems to make all your cares go away. So glad to hear you had a relaxing weekend! Awesome! Our new home makes us recycle too, and right now I just have a shopping bag that we put everything in. But I did go to BB&B to get my trash can, and used the 20% off coupon as well. Can't beat it and the items they have are very nice quality. So far, we love our trash can and it really has made me happy as weird as it sounds!